I was in the midst of researching Roy O. Disney and needed details on tributes to Mr. Disney in the parks. It was Christmas and I had friends visiting the Walt Disney World Resort from Betweenland. At one point at 11 p.m. WDW time I was yelling into a cell phone hoping my friends could hear me over the capacity crowd, "I NEED A PICTURE OF THE DAVIS WINDOW." Needless to say they could not hear me, could not find the window and only days later even figured out what I was looking for. In today's world I could have avoided yelling. Main Street Windows by Jeff Heimbuch chronicles the visual tributes to Disney employees who have influenced the theme parks through honorific windows located primarily on Main Street U.S.A.. Heimbuch takes his readers through Disneyland, The Magic Kingdom, Tokyo Disneyland, Disneyland Paris and Hong Kong Disneyland with a glance at every current window and even a few that have been removed. Typically on the left hand pages Heimbuch provides the window text and biographies of the honored individuals with the right hand pages showing a picture of the window itself. For the American parks this pattern if followed with every two pages featuring either one or two windows. In the non-domestic parks there are less pictures and more windows featured every two pages primarily by text. Though one discovers there are many more atmosphere only windows outside of the United States. You ever try to take a good picture of Main Street Windows? I have. It is hard! You think to yourself you can do it, you can get the right angle and the right light and it will happen...with your phone! Yeah, you are hot mess if you think you can pull it off with a lack of time or equipment because with overhangs, canopies and angles shooting from the ground you are fighting a losing battle. This for me is the real win of Main Street Windows, a resource with largely readable pictures of the windows. It is clear that Heimbuch's team of photographers knew their way around a camera and found ways to photograph the windows in their best possible light, literally in some cases. There are photos were shadows do obscure part of the window, but even the novice (like me) begins to realize the difficulty of photographing the windows and what a good representation of the widows the photos are. If for some reason cannot read the window, Heimbuch does provide a full transcript of the window's inscription. And he provides readers context by giving a brief write-up of who the window honors and why they deserved to be recognized on Main Street U.S.A.. As one reads through the biographies it becomes clear that many honored are not the known legends of Disney we can recite off the tip of our tongues. Instead there are numerous men and women recognized whose names do get thrown around but are honored for providing excellent service to the parks. The biographies for individuals with windows in multiple parks are largely copies of each other. If there is one thing I wish was added it would be an index. It is easy enough to scan through the book with names in bold and text primarily being printed on the left hand side. But an index would help speed readers to the window they are seeking in the book. 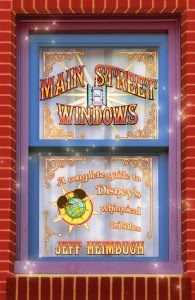 Main Street Windows by Jeff Heimbuch is the most comprehensive book on Disney's Main Street Windows. For me it is an important reference, as any Disney writing I do includes me wanting to know about window tributes in the park. Main Street Windows will be a first reach for me when I start to assemble outlines on Disney parks related projects in the future.